There's nothing like the satisfying click-clack sound and feeling of a manual typewriter. Our classic black Manual Typewriter is both decorative and practical, the ideal solution for addressing envelopes, filling out forms, writing short notes or creating the Great American Novel. It makes a great conversation piece, or a fun way for children to practice their writing. Includes clamshell carrying case and black/red ribbon. Two Correctable Film Black Ribbons per package. Also known as H21000. 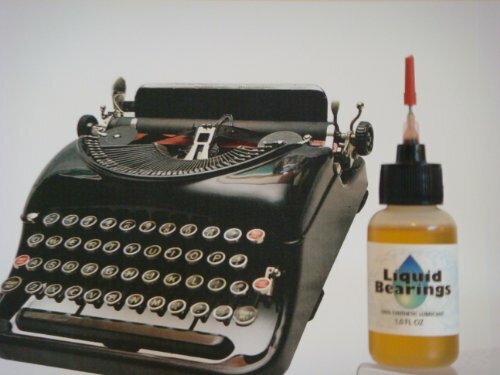 ULTIMATE 100%-synthetic oil for any typewriter, restores sticky keys, makes typewriters smoother and quieter!! This is the synthetic lubricant that consistently outperforms all others currently available. It has incredible low and high-temperature characteristics, which is absolutely necessary for proper typewriter lubrication but completely lacking in petroleum-based oils. 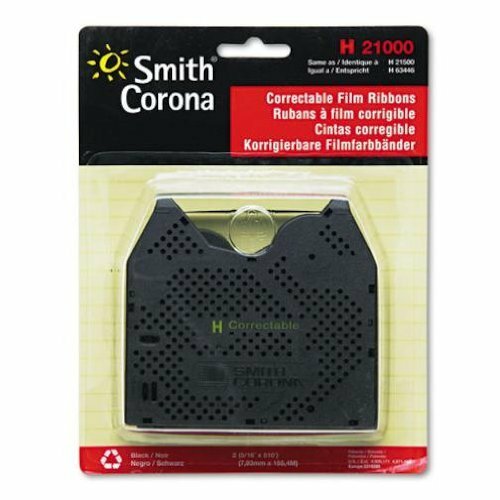 Don't use them on your typewriters any longer! Actual oils and lubricant sprays leave sticky deposits when they evaporate over time. Real oil is made up of a mixture of long and short chains of carbon and hydrogen atoms, and under certain conditions the short-chain molecules evaporate, and the unstable molecules oxidize and break down. This leaves a sticky residue which can actually "gum up" the device it was intending to lubricate. Conventional oils also contain impurities such as sulfur, waxes, and unstable hydrocarbons which are left behind as residue deposits. In contrast, synthetic oils are made using a process that re-arranges the structure so all the molecules are uniform in size, shape, and weight, an ideal phenomenon which does not occur in nature. Synthetics are custom-designed to produce the ultimate lubricant, with inherent performance characteristics vastly superior to any petro-oil. Liquid Bearings is also essentially odorless, so your hands and clothes won't smell like oil after using it. It is perfectly safe to begin using Liquid Bearings on all your typewriters immediately, even if you have been lubricating them with conventional oils for years or decades. It is fully compatible with all vintage and current oils, and will eventually flush away the residue of the evaporated real oil over time. You will easily notice that your typewriters operate more easily and quieter with Liquid Bearings, especially if you have been using petroleum-based oil on them for years. It is completely plastic-safe, and will not harm painted surfaces. The bottle is top-quality LDPE, and the stainless needle allows the application drop-by-drop. Immediately restores sticky or frozen keys to full movement!! Instantly displaces sticky deposits of old petro-oils or sprays. Makes all typewriters operate quieter and smoother! Includes both 1/2 AND 1-1/2 needles, each with tip scabbard! Cassette daisywheels for Brother Typewriters, word processors and computer printers only. 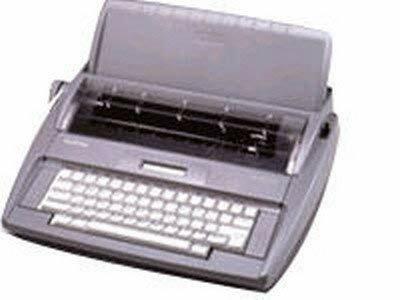 Pitch Selections: 10 OEM/Compatible: OEM Type Style: Brougham Device Types: Typewriter Printer Word Processor. Being a productive writer doesn't necessarily mean constantly staring at a screen. 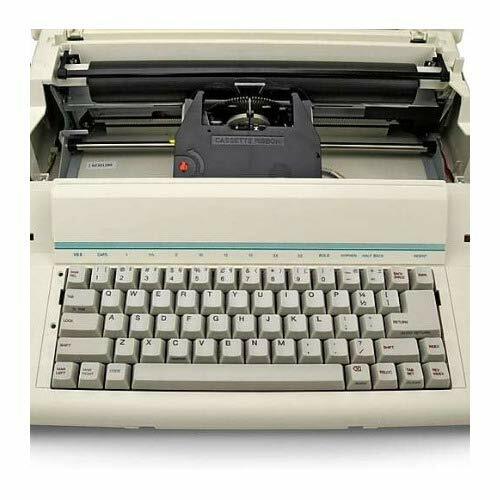 The Royal Scriptor II is a great typewriter with all the features you would ever need. It has a great 2-line LCD display, 80,000-word spell check and more. In 1904, in a small machine shop, two men produce their first Royal typewriter. Their guiding principles of innovation and quality are the foundation of their company and products. And now today, Royal brings you the Classic! 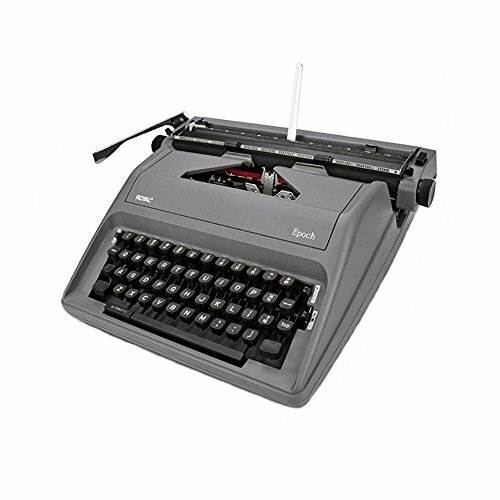 The Royal Classic Portable Manual Typewriter features all metal construction, a wide 11 in. carriage, 88 characters, and a black and red nylon ribbon. It's ideal for those who prefer a nostalgic d cor, a retro look or an escape from digital technology. A true wireless device the portable Classic is perfect for on-the-go authors! Comes with a pre-installed ribbon, storage case and owner s manual. 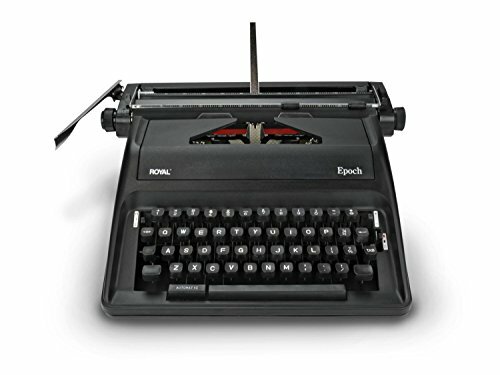 The Royal Epoch Manual Typewriter features a wide 12.5" in. 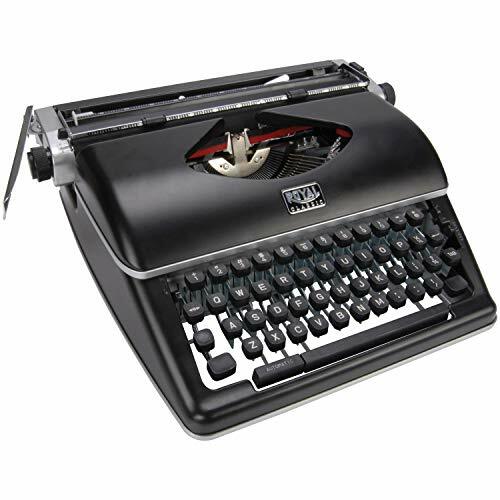 carriage for typing its 88 characters on the black and red nylon ribbon. Lightweight and classic style features 11.6" maximum print width and 11" typing width. Space bar repeater key, line spacing and tab setting. Margin tabs stop with release key, has paper and carriage release lever and ribbon color selector switch. Impression control lever and 1", 1.5" and 2" variable spacing. Includes bilingual manual and sturdy carrying case. 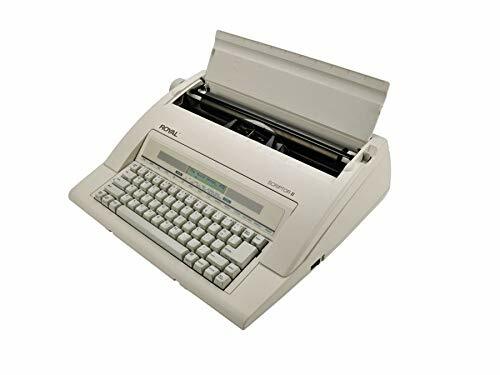 Portable and easy to use, the Brother ML-100 daisy wheel electronic typewriter is ideal for any person who thrives on timesaving dependability. 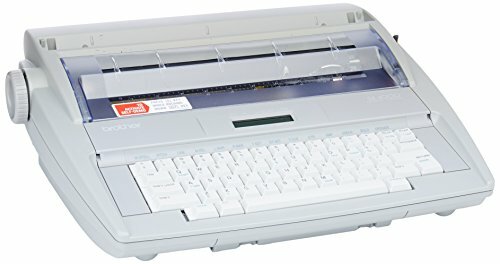 This entry-level typewriter from Brother's ML series comes with such essential automatic features as automatic paper insertion to properly insert each page to a uniform 1-inch top margin and the automatic Word-Out correction system to erase mistakes with one simple stroke of a key. Brother's Perfectype professional touch keyboard helps to provide increased accuracy and typing speed with its unique design. Essential to any professional typewriter, all Brother ML series computers include the standard U.S. English and international daisy wheels. With the ML100, you are able to easily access the international characters necessary for typing in a number of languages including English, Spanish, French, and Portuguese. Additional keyboard settings allow you to choose the proper character set for specific international characters. 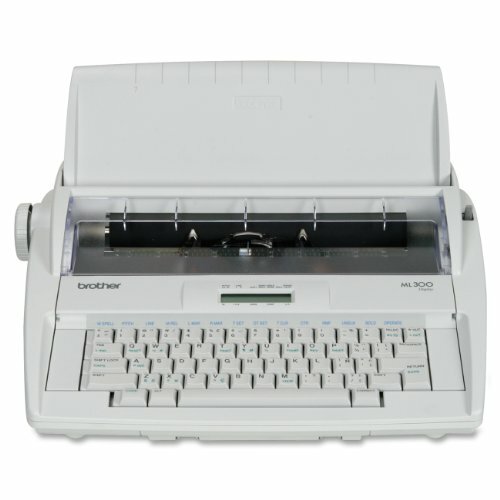 The Brother ML-100 comes with superscript and subscript typing, one-touch tab, 65-character correction memory with an automatic relocation feature, and a one-year warranty. 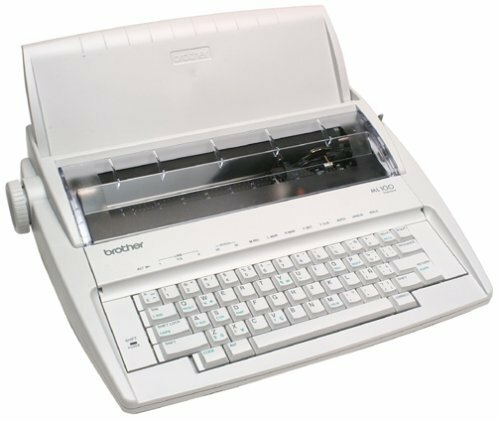 The Brother ML-100 offers a sensible solution for users who need a reliable, take-anywhere typewriter for home, school, or the office. 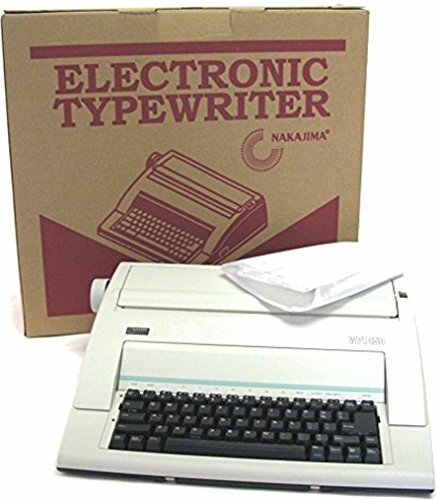 NAKAJIMA WPT160 ENGLISH - PORT TW/MEM/DSPLY/SPLCK ~13" carriage - ~20 character display - ~Up to 12 cps - ~80,000 word dictionary - ~10, 12, 15 pitch selections - ~Full line correction memory - ~16,000 text memory - ~Word and character erase - ~Prestige Pica 10 included - ~1 year limited warranty - ~16"
|SS-TW-ATO-CB|... These ribbons and lift off tapes are freshly manufactured following the specifications outlined for your typewriter and each item is unconditionally guaranteed to provide excellent performance. Professional support at 913-384-4646 is available for any questions. 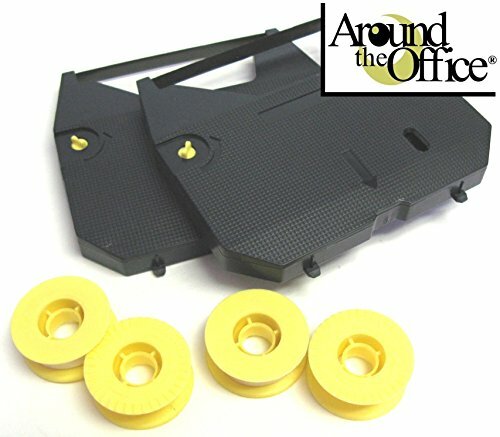 Around The Office products are designed and manufactured for office products that have been discontinued and allows your machine to continue operating with the best supplies available. 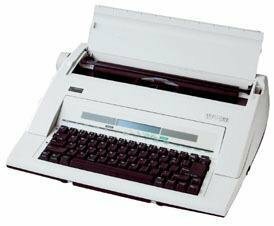 ML-300 Daisywheel Electronic Dictionary Typewriter is the mid-level portable typewriter. The 78,000-word, built-in dictionary encourages letter-perfect spelling. Unique features include its international keyboard, bonus international daisy wheel and the Perfective professional-touch keyboard. Typewriter offers easy access to the characters necessary for typing in a number of languages, including English, Spanish and French. Design also includes a 16-character LCD; 12.87" carriage; 9" typing width; and 10, 12, 15 pitch typing (Pica, Elite, Micron). 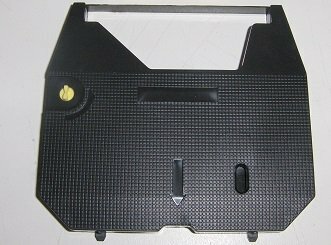 Typewriter uses Brother 1030 correctable ribbon. Refer to the user manual before for troubleshooting instructions. Items will fit in nearly all typewriters that use a 2 inch ribbon spool or you can take the custom colored ribbon off our spool and rewind onto your antique spools. Designed for Brother Typewriters, Consul Typewriters, Daro Typewriters, Diana Typewriters, Empire Typewriters, Everest Typewriters, Fact Typewriters, Halda Typewriters, Hermes Typewriters, Imperial Typewriters, Good Companion Typewriters, Oliver Typewriters, Olympia Typewriters, Olivetti Typewriters, Remington Typewriters, Royal Typewriters, Scientific Typewriters, Sears Typewriters, Smith Corona Typewriters, Underwood Typewriters. All of the FJA Products Typewriter Ribbons are made in the USA. We are US Veteran Owned and Operated. These Ribbon/Spools are BRAND NEW and freshly made. The ribbon and spools are attached and sealed in a plastic bag. The spool diameter is 2 inches and the ribbon is 1/2 inch wide. We provide an expanding center core to accommodate almost any spindle size. The pictures shown by FJA Products is what we are offering. Just open the bag, place the ribbons spools into the spools cups, feed the ribbon through the ribbon guides of your typewriter and begin typing. Need help? Call our Toll Free 800 number to speak with us. Our 800 line work in USA and Canada. Typewriter Installation Video is online and FREE. You will need to call for the link or Search FJA Products on Youtube. New reboxed item with full new machine guarantee by Around The Office. The Royal Scriptor Portable Electronic Typewriter is the perfect tool for all your editorial needs. It's the ideal machine if you want to add a simple typewriter to your inventory. The Royal Scriptor Portable Electronic Typewriter boasts a standard qwerty key layout design. It features 45 keys, 17 functions, and a 20 keystroke buffer. 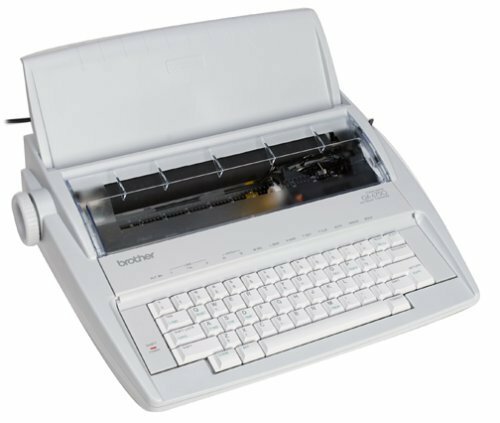 Whether you're authoring your next best-selling novel or working on a college thesis, the Scriptor Portable Electronic Typewriter has you covered. Variable line spacing gives you the option of typing text on pages in 1-inch,1 1/2-inch or 2-inch line spacing. 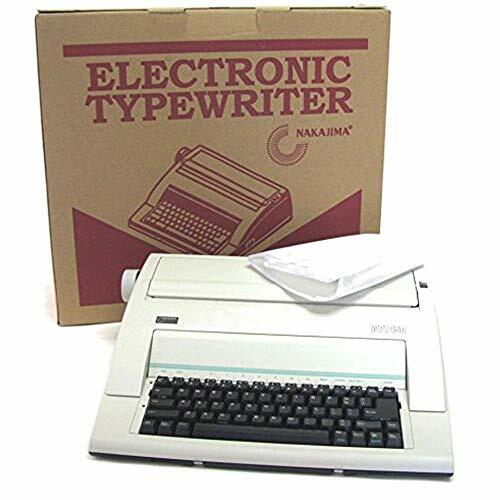 In comparison to manual retro typewriters, the Royal Scriptor Portable Electronic Typewriters has more character options. Besides bold typing and automatic underlining, it also offers superscript and subscript for setting smaller sized characters slightly above or below the line. The Royal Scriptor eliminates the need for correction fluid and tape pens. It features a word spell check Merriam-Webster Dictionary. The Nakajima WPT-150 Electronic Typewriter is a portable typewriter packed with useful features. 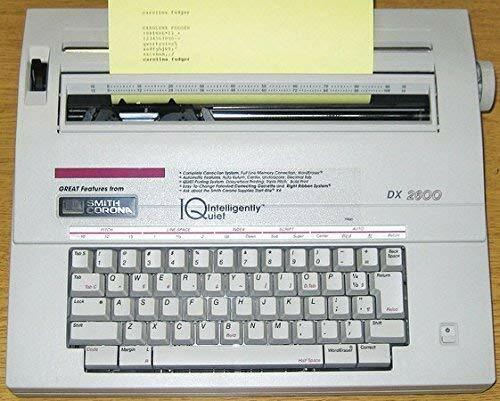 It comes with one-line correction memory, word and character erase, automatic centering, underlining and carriage return, and many other functions. It has a 13-inch carriage, 9-inch print width and a 12 character-per-second print speed. It has 10, 12 and 15 pitch selections and 1-inch, 1.5-inch and 2-inch line spacing. It includes a 100-character Prestige Pica 10 printwheel.